In 2014, Saturn and Pluto continue to be engaged in what is called mutual reception. Pluto is currently in Capricorn, the sign ruled by Saturn. At the same time, Saturn is moving through Pluto-ruled Scorpio. Mutual reception means any dissonance between the planet and the zodiac sign it is traveling through tends to be minimized. You can think of it as the astrological equivalent of a house-swap. The mutual reception between Saturn and Pluto magnifies the themes associated with these two planets and their zodiac signs they rule. Pluto's name derives from ancient Roman mythology's ruler of the underworld. Pluto/Scorpio relates to all matters that "polite society" tends to sweep under the rug. Any topic that more socially conservative people seek to avoid in conversation, or use euphemisms when discussing, falls into Scorpio's domain. Scorpio knows the location of every toilet in the house as well as which skeletons rattle inside which closets. Saturn, on the other hand, is associated with the sign of Capricorn. Capricorn is less concerned with intuiting the location of hidden skeletons, and more focused on getting things done, preferably by a staff of servants. Saturn/Capricorn themes include discipline and ambition. What both Scorpio and Capricorn share is a preoccupation with power. This stage of mutual reception began in October 2012. As we have seen since then, the combination of Saturn and Scorpio calls upon each of us to become accountable for our shadow side. We can't hide in denial any longer. Evasions and halfhearted apologies for wrongdoing will no longer suffice. Concurrent with the Pluto-Saturn mutual reception, we are also in the midst of an ongoing Pluto-Uranus square aspect. Pluto, already deeply immersed in the power issues related to its mutual reception with Saturn, is simultaneously involved in a long-term friction relationship with Uranus (sudden change, revolution) and Aries (individualism, combativeness). This aspect will become exact twice during 2014, exacerbating the sense of tension. Explosive events, whether political, individual or weather-based, become more likely to occur around these times. Bear in mind, however, that these explosions are often figurative rather than literal. Also, in many cases, these explosions can feel much like lancing a boil, bringing an end to a painful situation. During 2014, these astrological forces are likely to be magnified by the involvement of Jupiter. Like a third party jumping into a dispute between two combatants, Jupiter will enter the fray between Uranus and Pluto this year, as it forms a compound planetary aspect known as a T-square. Jupiter in Cancer will oppose Pluto in Capricorn and square Uranus in Aries. These aspects will go in and out of exact orb during the first part of 2014. Since Jupiter enlarges whatever it touches, look for some already touchy situations to blow up into major brouhahas. Not all the Jupiter news for this year is bad news, however. The largest planet will also participate two separate Grand Trine aspects. The first of these will be May in water signs while Jupiter is still in Cancer. The water Grand Trine, also involving Saturn in Scorpio and Chiron in Pisces, will take place simultaneously with Jupiter's participation in the T-square mentioned above. This could mean that the high tension of the square aspect is softened a bit by the Grand Trine. Or we could witness a situation where a tragic event somehow motivates people to seek healing and reconciliation. Jupiter changes signs on July 16, 2014, shifting from compassionate Cancer to passionate Leo. The fire Grand Trine will take place in early October. The other two planetary players in this triangle configuration will be Uranus in Aries plus Mars in Sagittarius. Two astrological events will augment the already powerful innovative potential of these three planets harmoniously holding hands. The Lunar Eclipse on October 8 sees the Moon positioned conjunct Uranus. This might mean that an important turning point of forgiveness and resolving or letting of old grievances opens the way toward creative new alliances. Kite aspects, which add an opposition to an existing Grand Trine, are thought to add vigor and creative energy to these planetary triangle formations. Less than a week after the Lunar Eclipse, the Sun joins the North Node in Libra, shifting the Grand Trine into a kite formation. This emphasis on Libra, sign of relating and balance, should help promote harmonious solutions. Yearly 2014 horoscope for each zodiac sign. Follow the 2014 horoscopes directory links below. Read your free 2014 chinese horoscope! Free 2014 horoscope for the 2014 year of the green Horse, annual 2014 horoscopes for your western zodiac sign. Daily horoscope weekly and free 2014 horoscopes, configuration of the planets, the sun, and the moon in the sky at a particular moment. Free 2014 western horoscope for the period of the year of the green Horse . 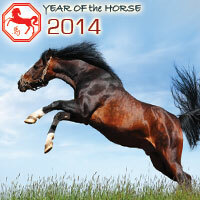 Free 2014 western horoscope for the period of the year of the green Horse.